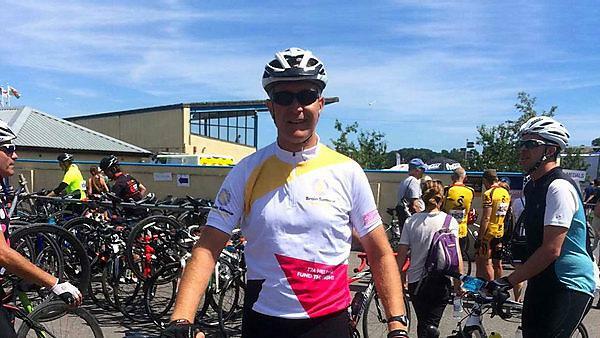 Professor David Parkinson, a neuroscientist from the University of Plymouth is in training for a gruelling 100-mile cycle ride to raise funds for research to find a cure for brain tumours and other tumours of the nervous system. A keen cyclist, Professor Parkinson is using this challenge to celebrate his 10-year anniversary working within the internationally-recognised specialist brain and nervous system tumour research at the University. He aims to raise at least £500 for pioneering charity Brain Tumour Research, which supports the team. Brain tumours kill more children and adults under the age of 40 than any other cancer but just 1% of the national spend on cancer research has been allocated to this devastating disease. The charity is striving to fund a network of seven dedicated research centres whilst challenging the government and larger cancer charities to invest more in brain tumour research. Professor Parkinson is among 24 cyclists supporting Brain Tumour Research by taking part in Prudential RideLondon, described as “the world’s greatest festival of cycling.” Some 25,000 are expected for the RideLondon-Surrey 100 mile sportive which will set off from the Queen Elizabeth Olympic Park in east London on Sunday 30 July before heading through the capital and out into the Surrey countryside and returning to the finish on The Mall.